Public service announcement: We've just discovered this season's easiest and most stylish outfit pairing, and surprise, surprise, the French girls were doing it first. In classic Parisian style, it's a super-simple formula—and we mean really simple. It's just the inspiration we need to re-create that elusive Gallic je ne sais quoi. Cardigans and jeans, you've never looked so chic. The humble cardigan has been experiencing comeback over the last few months, challenging the classic crew-neck for the knitwear top spot and establishing itself as the fashion girl's go-to. 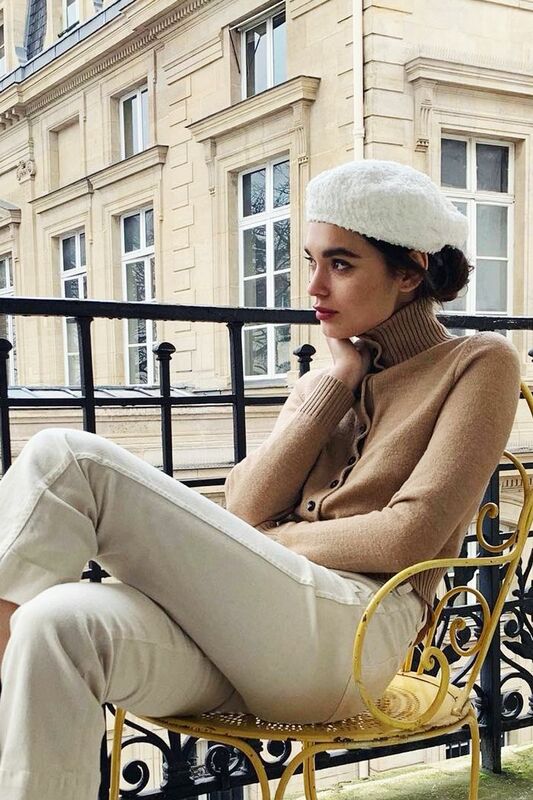 But French girls have officially taken ownership of this particular outfit pairing, with everyone from Jeanne Damas to Solange Smith offering up their own interpretation. There are so many ways to wear this look. The general consensus amongst Parisians is that muted tones are a must, whether it's a cream cable-knit cardi or black cropped number. These colours will go with all your favourite jeans and won't feel constricted to a certain season. We've also seen plenty of pastel offerings, which will make for a perfect partner with this season's leopard denim. If you're looking for guidance on navigating this look (we get it, the cardigan can be a tricky trend to get your head around), we've done the hard work for you and created a cardigan-and-denim shopping edit. Scroll down to see and shop our favourite pieces and get pointers from the girls themselves. You'll be Champs-Élysées–ready in no time. Style Notes: If the weather is still feeling a little chilly, make like Leia and layer your cardi under a puffa. Style Notes: Jeanne Damas is giving us so much knitwear envy with her pale-pink piece. We like how she styled it with high-waisted jeans and a basket bag. Style Notes: A beige cardigan feels summery fresh when paired with cropped white denim and mules. Style Notes: Change up your weekend wardrobe with a cropped cardi and white sneakers. So comfy yet so cool. Style Notes: We're getting plenty of vintage vibes from Sabina's embroidered, bobble-knit cardigan. A sequinned bag is an ingenious way to keep this look from feeling too frumpy. Style Notes: We never thought we'd see the return of the cropped jumper, but Anne-Laure makes it look so relevant with high-waisted jeans and a chain belt.